Over 150 demonstrators chanted anti-Keystone Pipeline slogans along San Vicente Boulevard June 7 protesting the controversial Canadian project crossing America with thousands of miles of oil pipelines. Those pipelines cross the country’s breadbasket aquifer that could be contaminated permanently from oil leaks and spills. 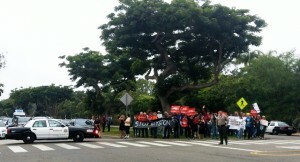 The spirited protest aimed to get President Obama’s attention as his limousine passed to a La Mesa Drive fundraiser. 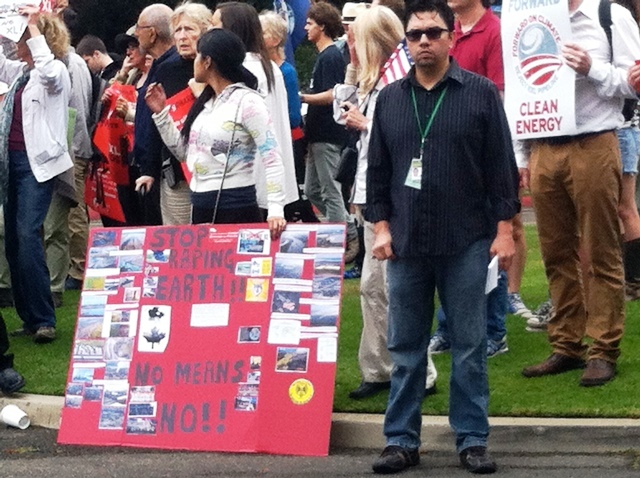 The rally included dozens of Sierra Club members who waved signs to passing motorists demanding Obama not approve the final link in the Canadian-owned pipeline. When finished, the pipeline will pump oil sands bitumen 2,151 miles from Hardisty, Alberta to refineries in Houston and Port Arthur on the Gulf Coast. Critics of the pipeline decry its environmental impacts. Those include destruction of sensitive habitat and contamination of the Ogallala Aquifer through oil leaks and spills. Tar sands also contribute to global warming by continued reliance on petroleum-based energy supplies according to pipeline foes. Carlos declined to give his last name, pointing to two men working the crowd trying to get certain demonstrators they photographed to tell them their identities. One wore a realistic-looking Los Angeles Police Department press badge but with no media affiliation visible. He did not look like or conduct himself like a reporter. His partner took dozens of photographs of the protesters including Carlos. Uniformed Los Angeles County sheriff’s entered the protest to remove an oil barrel prop presumably because the empty container presented a public danger. The President was several hundred yards away making the object suspect. The crowd cackled as the officers wrestled the plastic barrel into the back of a squad car. 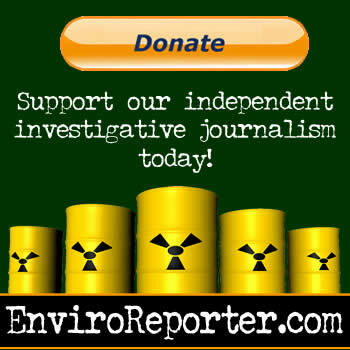 Unbeknownst to the protesters, a deranged gunman across town less than a mile from EnviroReporter.com offices went on a rampage killing five people before finally being shot dead at Santa Monica College. That tragic news eclipsed media coverage of the demonstration which ended up not being seen by Obama whose motorcade used a route that avoided the rally. The protest was impressive especially considering that Americans now favor the pipeline by a whopping 82% according to a June 3 Harris Interactive Poll. Even as heavy Obama contributors like billionaire Democratic donor Tom Steyer ask the President to oppose the pipeline, the Administration shows no signs of stopping the massive project. Outraging environmentalists, the State Department overruled the Environmental Protection Agency’s negative take on the impacts of Keystone when the department released a positive report on the pipeline that was actually written by EnSys Energy which has worked with firms that have tar sands clientele. The firm has worked with BP, ExxonMobil and Koch Industries, all of which own oil sands production resources and refineries in the Midwest. Those kind sentiments were in poignant contrast to the slaughter taking place two miles away. The likelihood that the protesters will influence a President who has become the oil and gas industry’s best friend is unlikely, a somber reality not lost on them. Neil Young just visited the climate-killing Canadian tar sands mines — and the folk-rock star had some harsh words for what his home country is doing to the planet. There’s something happening here, but what it is is very clear: Top climate scientists say continuing to develop the tar sands would be “game over” for the climate. The destruction of the pristine boreal forest is terrible for wildlife. Tar sands pipelines are more likely to spill down by the river than regular oil pipelines. And like Neil said, cancer rates near the mines are way up. It doesn’t take a heart of gold to know how wrong the tar sands really are, or to stand with the climate and the First Nations. A Sierra Club Facebook image with one of Neil’s quotes is going viral. You’ll love it, and your friends will too. Will you like this image on Facebook, and spread the word about how toxic Canada’s tar sands really are? This environmental damage just isn’t worth the greed. After the oil money gold rush is over, even the greediest executives will see the damage done wasn’t worth it — public health should always come before private profits. The good news is, by speaking out together, we’ve already delayed Keystone XL for years, and possibly stopped it. This movement has the momentum, and by continuing to raise our voice and recruit our friends, we can save the climate from the tar sands. 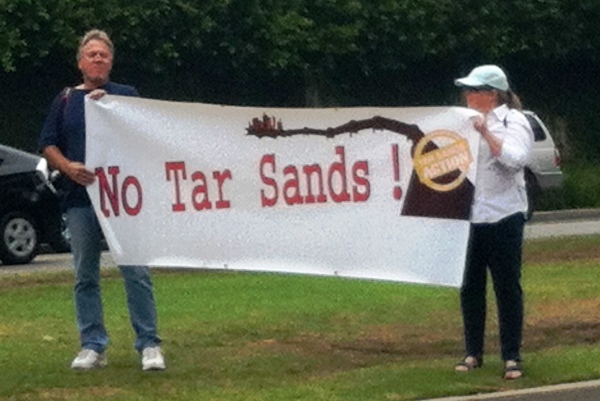 Help grow this movement by showing this Neil Young tar sands image to your friends — like it on Facebook today! P.S. Alberta is known for its cowboys, and we’re talking about the tar sands — so there’s gotta be a great “Cowgirl in the Sand” joke somewhere in here, but I’ll be honest with you, I just can’t find it. Please accept my apologies for that — and keep on rockin’ in the free world — by sharing this image. 1. Koring, Paul and Kelly Cryderman (2013 September 10). “‘Fort McMurray is a wasteland’: Neil Young slams oil patch, Keystone plans.” The Globe and Mail. 2. Hansen, James (2012 May 9). “Game Over for the Climate.” New York Times. 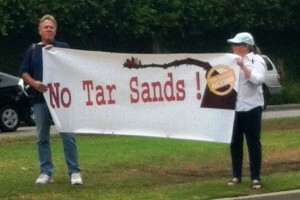 Watch the clip and tell President Obama not to wait: Kill Keystone now! The fight to stop the Keystone XL pipeline has been all about beating the odds. Two years ago the pundits and oil companies alike thought this dirty, dangerous pipeline was a done deal. But then, front page press coverage about conflicts of interests in the environmental review process forced a delay that no one saw coming. Fast forward to 2013, and everyone expected the president to make his decision on the pipeline this Fall. But now it looks like there may not be a decision until next year. In the words of Rachel Maddow, that’s a win! Thanks to our work uncovering fresh conflicts of interests in the review process, the State Department’s Office of the Inspector General has launched an inquiry that won’t be completed until January 2014. But President Obama can end this fight right now, so it’s time to turn up the heat. Write to the President and tell him that the evidence is in — it’s time to kill the Keystone XL pipeline. Thanks to letters from Friends of the Earth supporters just like you, and the investigative work of our campaigners, the Inspector General’s inquiry is examining attempts by the company hired to conduct the environmental review to hide its financial ties to pipeline builder TransCanada and oil companies which stand to profit from the pipeline. But even without the results of the investigation, President Obama already has more than enough evidence to kill the Keystone XL pipeline right now. Over the past few months the Interior Department, the EPA, climate scientists and the entire environmental community have slammed the State Department’s environmental report on Keystone for glossing over the pipeline’s negative impacts on wildlife, water supplies and the climate. President Obama doesn’t need to wait for the corruption inquiry to make his decision. Tell him to use his authority to cancel the Keystone XL pipeline right now. This decision rests entirely with the president. Help us tell him to do the right thing. Thanks for joining us in this important fight. SANTA MONICA, CA –The Keystone XL pipeline will raise gasoline prices in the United States, hiking prices at the pump 20 to 40 cents per gallon in the Midwest, with no long-term economic benefit to the U.S. economy, says a new report by Consumer Watchdog. · Drivers, especially in the Midwest, would pay 20 cents to 40 cents more at the pump if the disputed pipeline were built, as the current discount of up to $30 a barrel for Canadian oil disappears. · The true goal of multinational oil companies and Canadian politicians backing the pipeline is to reach export outlets outside the U.S. for tar sands oil and refined fuels, which would drive up the oil’s price. · With U.S. oil production rising fast, any “energy security” benefit for the U.S. would vanish as American oil output exceeds that of Saudi Arabia in about 2020, according to the International Energy Agency. The report also found that Canadian crude oil currently being sent to the Midwest from Canada would be easily diverted to Keystone XL to satisfy overseas demand. Much of the Canadian oil would go directly to Gulf Coast refineries owned by the same multinational companies investing in tar sands, said the report. These companies include Exxon Mobil, Chevron, Koch Industries, Marathon Oil and Shell Oil, said the report. Gulf refineries would refine the tar sands crude oil into diesel oil, which is in high overseas demand, and gasoline for export. Political leaders in the Canadian province of British Columbia have officially opposed plans for a major new tar sands oil pipeline from Alberta through their province to the Pacific Coast. Two other similar proposals may meet the same fate, and are certainly years in the future. This Canadian opposition increases the motivation of tar sands investors and developers and to get Keystone XL built as sure access to overseas markets. While the pipeline developers have insisted that the pipeline would create tens of thousands of jobs, they have offered no proof of substantial jobs created beyond construction and maintenance of the pipeline itself. I’m generally in favor of pipelines as an energy-efficient way to transport materials. However, the more I read about this project the less I like it. We don’t need this goo. We’re better off focusing on conservation measures and sustainable sources of energy. Thanks for the article Michael. Kudos to these demonstrators who clearly were more of a threat to public order, as evidenced by the undercover goon so obviously spying on these peaceful people, than the nut who gunned down 5 people across Santa Monica at the same time. The pipeline to the president is filled with cash. I regret ever voting for the man.